Can evolution help us rebuild native habitats? 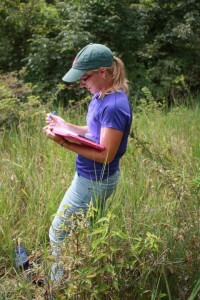 This post is by MSU graduate student Anna Groves. The concepts are really quite similar. But now that I study prairies as a graduate student at Michigan State University, I can’t help but notice the clear difference between the earlier and later song. What was once fondness for natural prairies becomes fondness for something that sounds a lot like a wheat field. Of course, you could perhaps cite the origins of the composers (one a pioneer, one an easterner visiting the west) or probably numerous other reasons why the lyrics are different, but to me, this is a clear illustration of what was happening across America around that time—we plowed up our grasslands and planted crops, and without thinking twice, we kept on plowing until there was almost nothing left of the native ecosystem. Historical North American tallgrass prairie range in dark green; estimated remaining range in red. Prairie species pictured: American bison (Bison bison), Greater Prairie Chicken (Tympanuchus cupido), Regal fritillary (Speyeria idalia), and Bobolink (Dolichonyx oryzivorus). Humans have converted a quarter of Earth’s land area for our own use . Some habitats and areas have been more affected than others— nearly half of temperate grasslands have been lost globally, and in some places in the U.S., this number approaches 99.9% . That’s a near complete loss of ecosystems like our own North American tallgrass prairie. Luckily, not all converted land is still in use, and there are lots of opportunities to restore native systems back into the landscape. Ecological restoration is the practice of rebuilding or rejuvenating native ecosystems that have been degraded or destroyed by humans. It’s easy to think about the ecology of native systems—especially restored systems— with some nearsightedness. If we re-plant a native prairie tomorrow, the goal is to make it work like a fully-functioning tallgrass prairie ASAP. There are businesses that will install a prairie on your property for you, and only the most patient and ecologically-savvy customers would accept “it’s mostly European weeds now, but give it 100 years, it’ll be great!” as a business model. Indeed, there is urgency from a conservation standpoint, too—at current rates of destruction, we need to start rebuilding for global stability of the next few decades, not centuries. There’s just no time to think about things like evolution—which happens over millions of years—is there? Yours truly, pre-graduate school, on the edge of a remnant prairie somewhere in western Illinois. Photo by Randy Nyboer. In reality, when we try to restore systems, we are likely not looking forward—or backward—far enough. 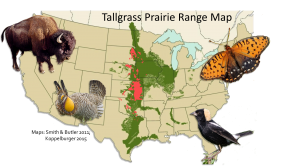 Much of tallgrass prairie restoration is focused on the plant community, since the plants make up the structural habitat that all the other mammals, insects, and such live in. As it turns out, there’s a lot we can learn from thinking about the evolutionary histories of the plants we’re trying to restore. This idea has been on my mind more than usual since last weekend, when I attended the Society for Ecological Restoration’s Midwest-Great Lakes annual chapter meeting. This group really knows their prairies, and are not only the best and brightest in their area, they are probably some of the best and brightest globally when it comes to restoring native grasslands. The keynote speaker  was Doug Ladd, the Missouri director of conservation for The Nature Conservancy. He has been a champion for tallgrass prairies for decades, and literally wrote the book on tallgrass prairie wildflowers (it’s called Tallgrass Prairie Wildflowers). Last weekend, Doug reminded us to remember the evolutionary history of our plants. To remember that the first grasses came into being 55 million years ago. Angiosperms (flowering plants) came after, and the first oaks (the quintessential prairie tree) appeared 35 million years ago. Although our plants are ancient, so much of the North American prairie landscape was covered with a giant glacial ice sheet until just 15,000 years ago. If you’re a 350-year-old oak tree, that’s less than 50 generations. And for nearly all of the time that’s passed since the glaciers melted, human beings lived in the Midwest as well—the Native Americans. Only very, very recently in evolutionary history did Europeans settle the U.S., finally bringing their plows and oxen  to replace the prairies with their beloved amber waves of grain. So, what does this tell us about tallgrass prairie restoration? It can be discomforting to think about the possibility that none of our ancient North American species actually had time to adapt to the post-glacial Midwestern landscape—especially now that we’ve gone and torn it all up, altered the soil chemistry and structure, and introduced countless other species from other continents to the landscape. The tallgrass prairie must be doomed, right? My (current) favorite prairie picture. 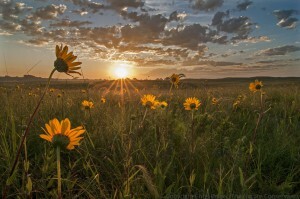 “Stiff sunflowers (Helianthus pauciflorus) greeting the sunrise in sand prairie. TNC Platte River Prairies, Nebraska.” Prairie and photo by Chris Helzer, The Nature Conservancy. For everything prairie restoration (and more pretty pictures), check out his blog. Wrong! The plants are adapted, and we have learned so much from looking to the past and considering the adaptations of our species. In fact, knowing which species are adapted to which types of sites (e.g. dry versus wet) is Restoration 101! And more and more, people are finding evidence that it’s important to use local ecotypes in restoration—which means collecting seeds from a plant population as close to the restoration as possible—so that plants are as adapted to local conditions as possible . Finally, we know that prairies are incredibly fire-dependent systems, and adapted in a landscape full of bison and other large grazers, as well as Native Americans who lit fires in their hunts. Some of our absolute best restoration success stories have come from large restoration landscapes that have re-instated fire and grazing management—some even re-introducing bison— that reflects what a prairie would have experienced once upon a time. Restoration ecology (the science behind restoration) is continually finding ways to utilize plant adaptations to improve how we restore. A popular line of research today is to use plant traits—qualities like deeper roots, bigger leaves, and height of plants—to match up species with the landscapes they are best adapted to. Another is to consider how the history of a particular site, in terms of which species established when, will influence which plants will persist at that site. These are just two of the many ways in which ecology is informed by what we know about plant adaptions from considering the evolutionary history of our species. We may not think about “evolution” in those terms, but thinking about species and their interactions in this way is critical for our success in restoring prairies to the landscape. I can’t promise skies that are not cloudy all day, but it seems increasingly likely we’ll once again be able to sing, oh give me a home, where the buffalo roam… ♫ all thanks to what we know about evolution. Hoekstra et al. 2005 Ecology Letters 8:23-29. Sampson & Knopf 1994 Bioscience 44(6):418-421. You can listen to Doug Ladd’s SER-MWGL keynote speech. Oh, my goodness. Did you know that the ox isn’t a unique species? It’s just a regular cow—usually a castrated male—that’s been trained as a draft animal. This city girl learned that fun fact embarrassingly recently. Last Monday. McKay et al. 2005 Restoration Ecology 13(3):432-440.